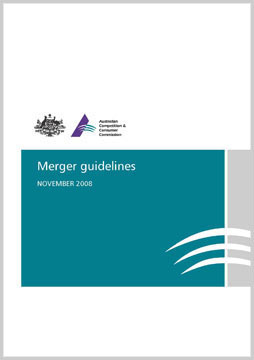 This publication outlines the analytical and evaluative framework applied by the ACCC when reviewing mergers under the Competition and Consumer Act 2010. It provides guidance on the factors the ACCC considers relevant to its consideration of mergers and includes discussion of the issues relevant to enforceable undertakings. The current guidelines were published in 2008 and replace the Merger guidelines 1999 ( PDF 487.85 KB ) . The guidelines were updated on 15 November 2017 to reflect changes in the legislation.